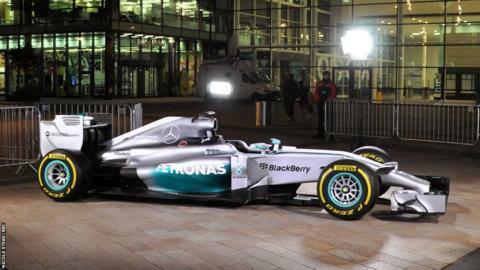 It is an early start for Lewis and the Mercedes F1 W05 Hybrid but both are ready for their close-ups before sunrise. 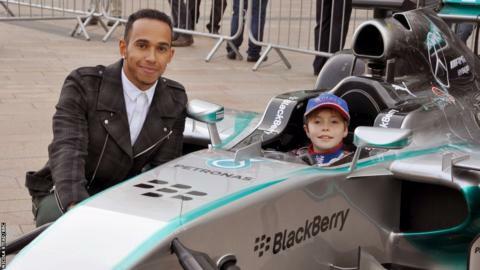 This particular car is a replica of the one Lewis crossed the finish line in to win the world title in Abu Dhabi on Sunday. 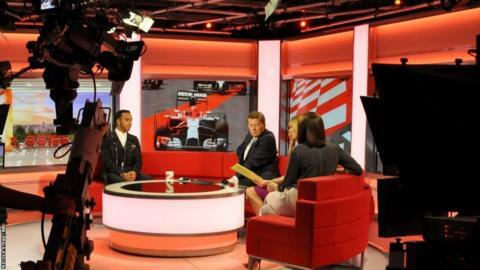 Here is Lewis on the famous red sofa with BBC Breakfast presenters Bill Turnbull and Louise Minchin, and sports correspondent Sally Nugent. 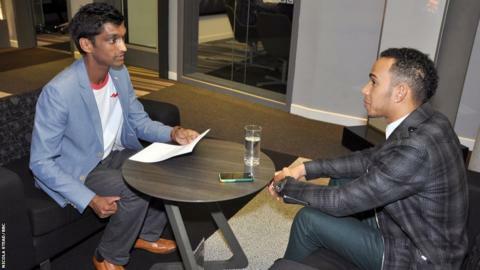 Ever stylish, Lewis wears a crisp white shirt for his live BBC Breakfast appearance - a stark contrast to his fireproof race suit and trademark flat-brimmed cap. 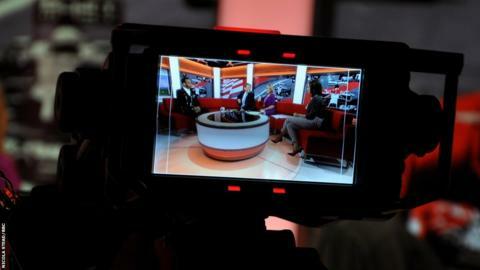 Bill, Louise and Sally ask questions about the rivalry between Lewis and his Mercedes team-mate and childhood friend, Nico Rosberg. 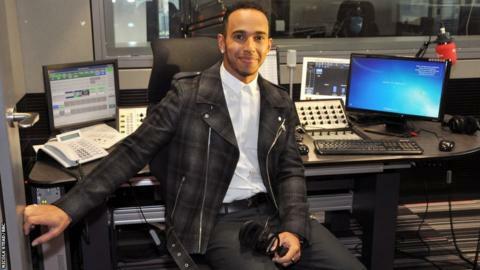 Television done and Lewis moves on to various BBC radio stations, starting with Radio 4's Today programme. 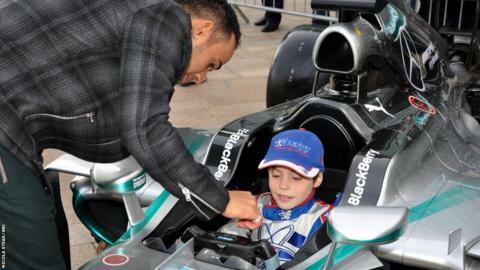 Next, he makes the dreams of nine-year-old karting champion Harley Haughton come true on BBC Radio 5 live. 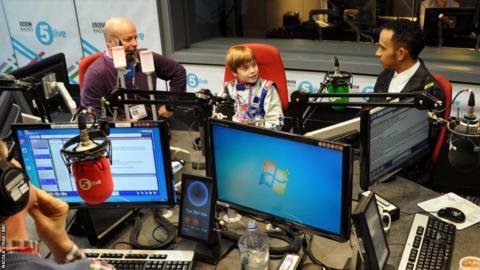 He heads for a quick chat with Radio 1's Newsbeat. 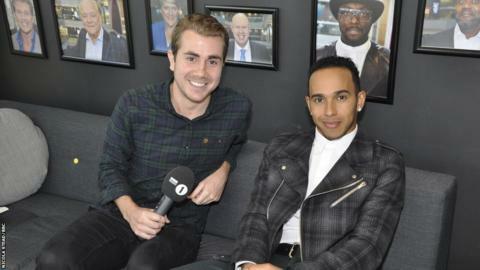 BBC Sport's F1 writer Lawrence Barretto poses a few of your Twitter questions to Lewis. You can read his answers in his last column of the season. 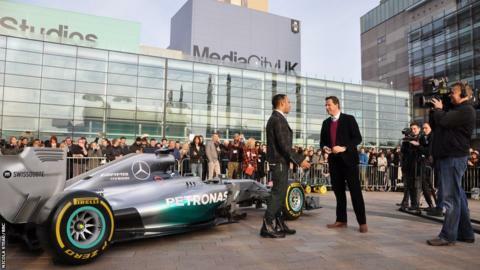 Olly Foster from BBC Sport News invites Lewis out on to the piazza at MediaCityUK to discuss the world champion's season at length. 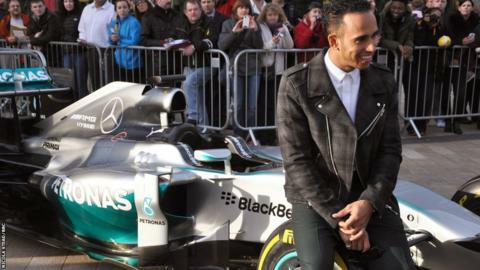 There is a tangible buzz around with plenty of F1 fans turning up to catch a glimpse of the world champion. Harley is back and this time is able to sit in the car and be shown the ropes by the master. It is a day Harley will not forget in a long time. Judging by some of the happy expressions on the faces of pupils and teachers, this could be a contender for best school outing ever. 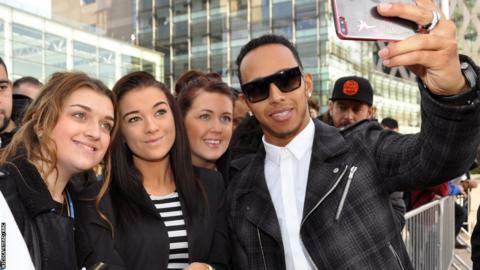 Lewis has time for a few selfies with fans before heading to his next destination.